When you think about going out for Japanese food, you think about sushi, right? Maybe hibachi, but usually not. Did you know there is another kind of Japanese restaurant altogether? No, it’s not a hybrid, like a maltipoo. It’s an entirely different breed. 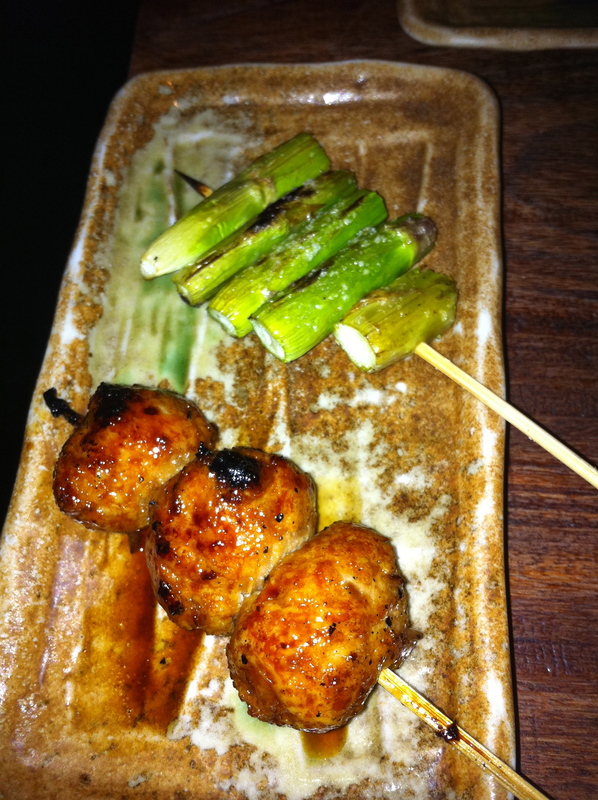 Yakitori literally means grilled bird in Japanese. So, a Yakitori restaurant is, you guessed it, place to get several courses of grilled chicken on skewers. Yakitori restaurants can be found all over Japan, or so I’m told. This Bite-Sized Blonde hasn’t been to Japan yet…one day, one day. Until then, I’ll just travel a few blocks north to have a little taste of Tokyo. Yakitori Tori Shin is located on the Upper East Side. Tori Shin means true chicken. The restaurant was so named because of their mission to promote the most authentic Tokyo style yakitori experience with the highest quality ingredients. The restaurant cooks organic chicken on charcoal grills for a unique flavor. This small restaurant offers 40 different chicken skewers, and lots of veggies too. For the timid diner, Tori Shin offers “regular” skewers of breast meat and wings. But, for those a little more adventurous, they offer gizzards, hearts, and livers! 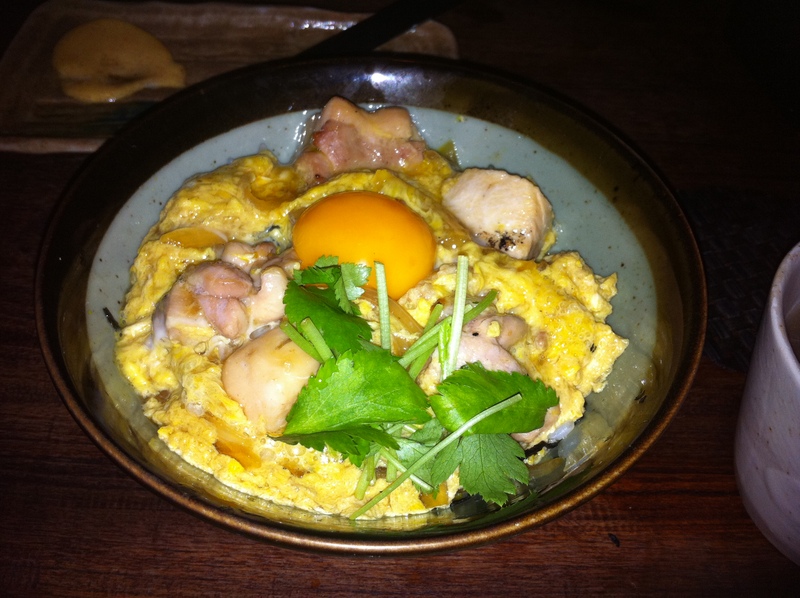 I have a few adventurous bones in my body, so I decided to go with the Omakase, otherwise known as the Chef’s Choice! The omakase came with pickled vegetables, grated daikon, 6 kinds of meat, 2 kinds of vegetables, a rice dish and dessert. We started with edamame. Nothing like a little taste of the familiar to calm your nerves. 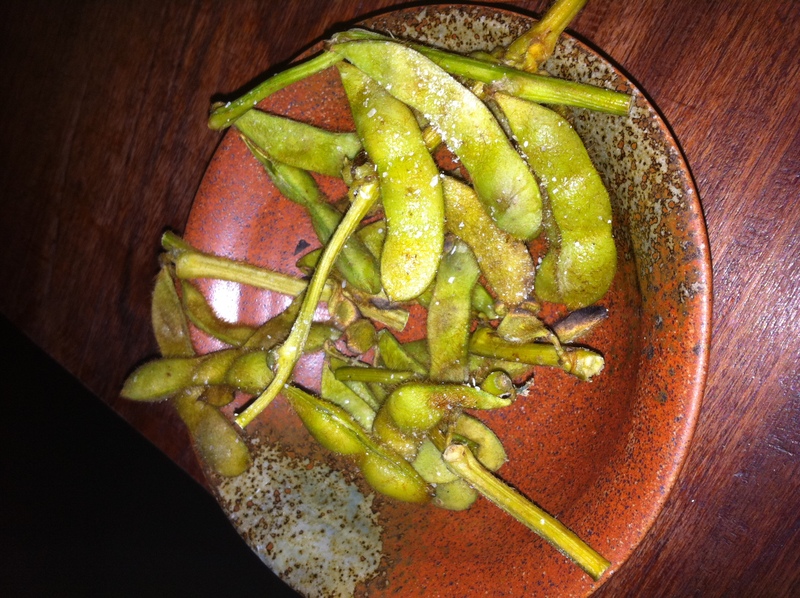 The edamame was kept on the branch, which makes for a beautiful presentation. It is prepared on the grill so it absorbs the smoky flavor. These edadmame were awesome! 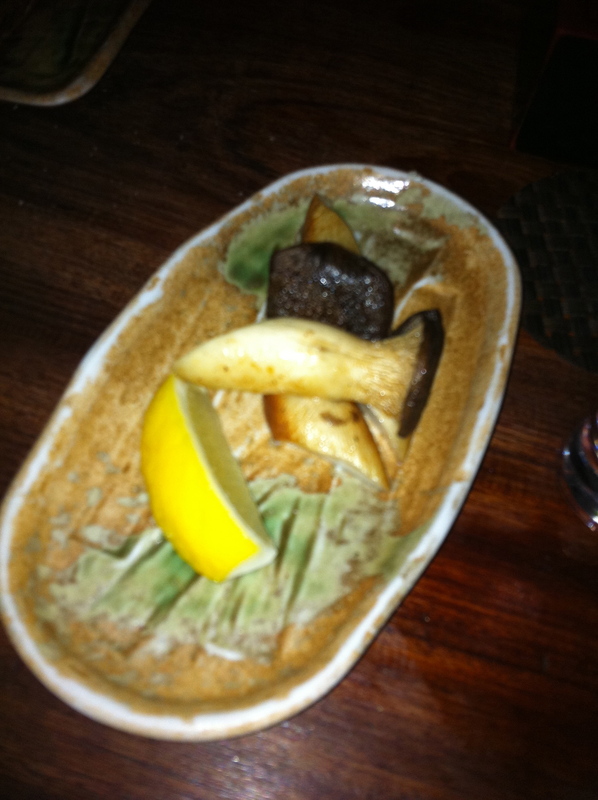 The Shitake Mushrooms were delicious, as they always are. They have a very distinct, woodsy flavor. The Corn was so sweet. I love grilled corn. Other than my corn salad, it is my favorite way to prepare corn. This did not disappoint! 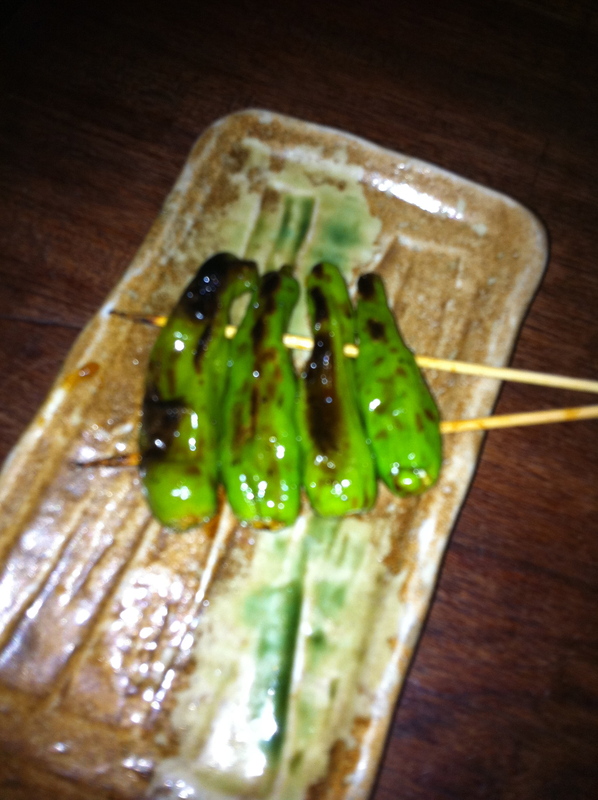 The Shishitou Peppers rocked. These tiny peppers are usually mild, but every now and again, you will get a hot one. The anticipation will drive you wild, and you know how this BSB likes to be kept on her toes. The Chicken with Scallion skewers were one of my favorites. The grilled scallions take on a sweet note, and the chicken is smoky from the grill. The Quail Eggs were so unusual. Not because they are quail. 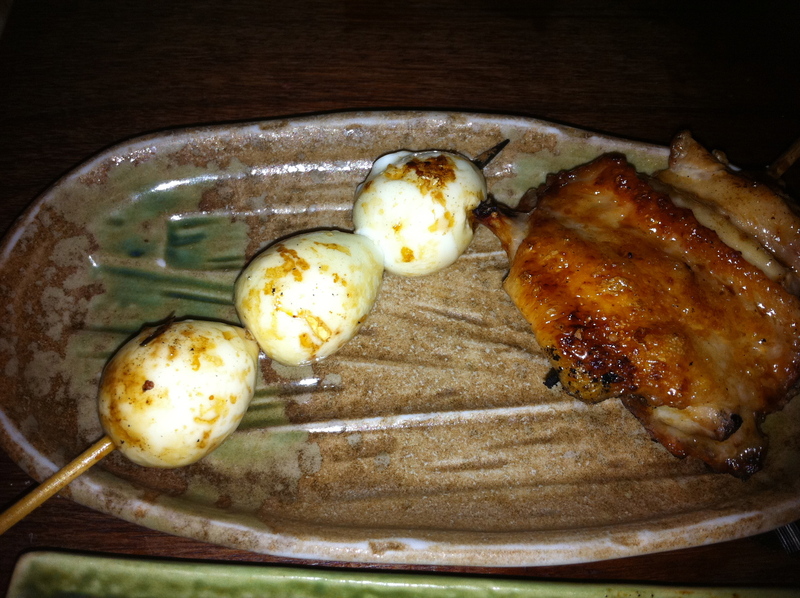 Quail eggs taste just like chicken eggs. But because they were grilled in their shells, they absorb that great charcoal flavor. These are a must-order! Neck. I know what you are thinking. No way Jose. But, I have to tell you, it was mighty fine. The neck tastes like any other part of the chicken. If you don’t know it’s neck, you would never guess it. Ignorance is bliss people! Ignorance is bliss. The Dark Breast Meat was good. It tasted like many of the rest of the dishes. Because there were so many interesting dishes to try, this may have gotten lost in the shuffle. The Meatballs were tender, the wings were flavorful, and the zucchini was sweet and mild. 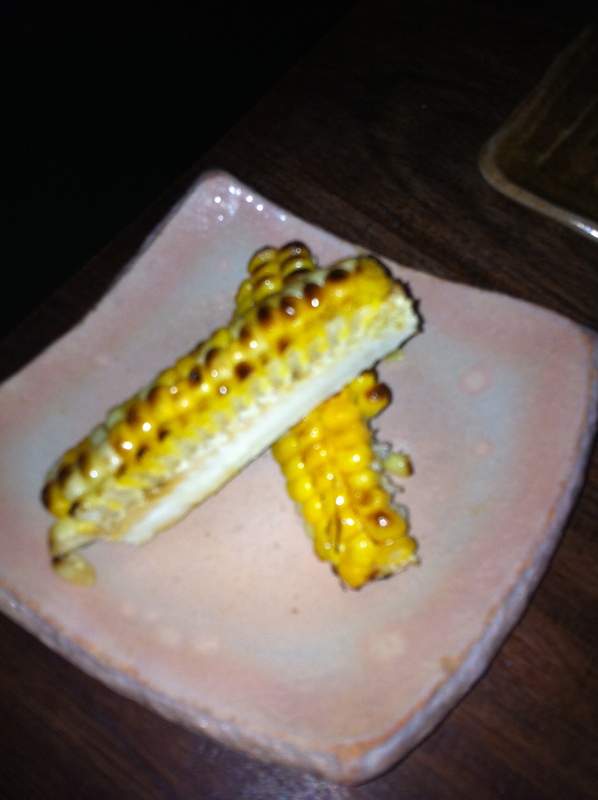 It’s all about the grill at Tori Shin and they really know how to use it. The Special rice dish is something I could have lived without. Not only was I full by the time we got this, but it was soupy. The extensive Sake list should be noted. Not a sake expert? Don’t worry, they are at Tori Shin. Another noteworth attribute: most of the seating is at the chef’s counter, so you get to see a show while you eat! You know how much this BSB loves that. Need a little more vacation time this summer? 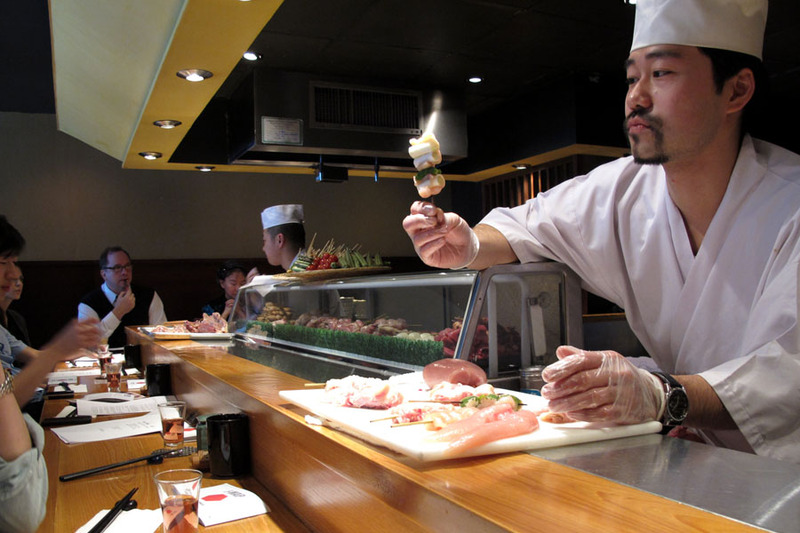 Head up to Yakitori Tori Shin for a little taste of Tokyo. It’s a vacation for your belly! This entry was posted in Restaurant and tagged Chef's Table, Chicken, Japanese, Upper East Side. Bookmark the permalink.